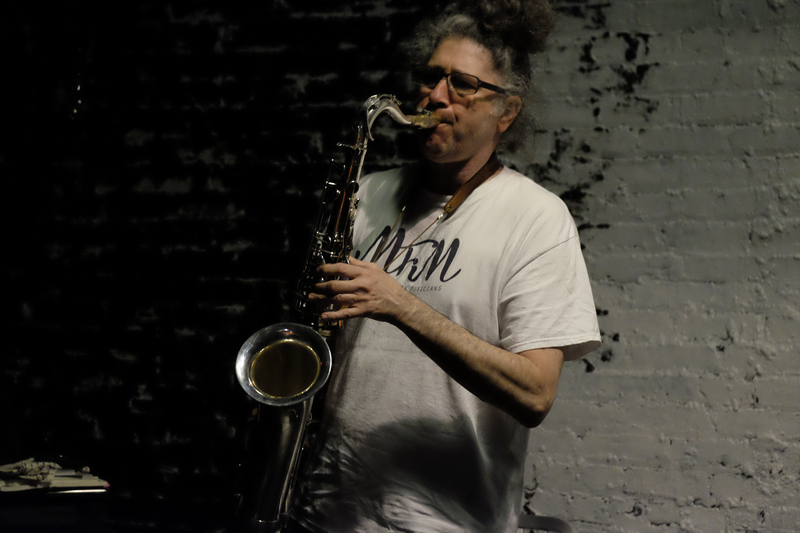 The two videos below show an interview with John Zorn and concert scenes of The Tehran-Dakar Brothers performing at THE STONE (NY) in the background. NBC (Channel 4) video taped parts of the concert and aired the footage, which was a piece of a segment on experimental music in New York, March 21 at 7:30 pm and March 22, 2009 at 1:00 am. This piece is featured on www.lxtv.com. In 2005 Sohrab started the Tehran-Dakar Brothers (TT-DB) in Tokyo with the Senegalese sabar player Wagane N’Diaye Rose who is the son of the famous sabar player Dou Dou N’Diaye Rose. After moving to New York in 2008 Sohrab re-started TT-DB, with Masamba Diop (on talking drum and music director of Baaba Maal) and Mar Gueye (on sabar, a relative of Dou Dou’s)) who are also both from Senegal. In December he recorded 5 tracks with them at Brooklyn’s BC STUDIOS. The line up is: Masamba Diop (on tama/talking drum), Mar Gueye (on sabar) and Sohrab (on sax). 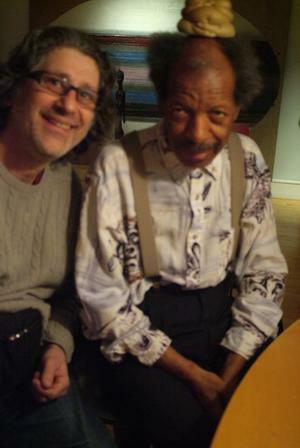 of his native Iran, with Persian, African and African-American rhythms. His music is molded by his international background. Green Movement and dedicated the song “Welcome Nu Iran” to the Iranian people. Sohrab added many new NY musicians in order to keep his music fresh and energetic which is based on composed-improvised songs. He sings and performs spoken word in Farsi and English. And his lyrics are very direct and don’t show any poetic expressions. In fact you can hear some dada-istic influences in his “Sprechgesang.” He wants to challenge the imagination of the musicians and the audience as well. On one hand he is very funny, but on the other hand very serious or angry. Why? Because he cares for people and can’t stand when people terrorize other people. Following musicians have joined Sohrab during the last two years: Damon Banks (b), Swiss Chriss (dr), Derek Nievergelt (b), Masamba Diop (talking drum, Baaba Maal member), Mar Gueye (sabar/Dou Dou N’Diaye Rose’s member), Alejandro Castellano (g), Kurt Dahlke (electronics), Satish (electric tr), Sylvain Leroux (fula flute), Piruz Partow (electric tar), Ladell Mclin (g). April Centrone (dr & per), Doron Lev (dr), Lukas Ligeti (dr), Al McDowell (b), John Kruth (electric mandolin), Brandon Ross (g), Michael Wimberly (djembe & dr), Lucas Jeanrichard (vibraphone), Jean-Marie Collatin-Faye (djembe) and Sheikh Tairou M’Baye (sabar). and many more. Check out below videos to get the right impression of Sohrab as a person and as a band leader. The line up: Sohrab (sax and vocal), Alejandro Castellano (guitar), Michael Wimberly (djembe & drums), John Austria (piano) and Lucas Jeanrichard (vibraphone). The line up is: Sohrab (sax and vocal), Doron Lev (drums), Alejandro Castellano (guitar), Derek Nievergelt (bass) and Piruz Partow (electric tar). 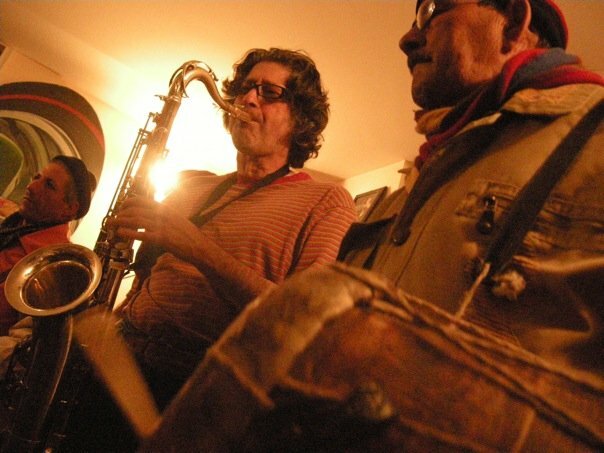 The line up is: Sohrab (sax and vocal), Doron Lev (drums), Alejandro Castellano (guitar), Satish (electric trumpet) and Sylvain Leroux (fula flute). The line up is: Sohrab (sax and vocal), Piruz Partow (bass, electric tar), Swiss Chris (drums, djembe) and Alejandro Castellano (guitar). The line up is: Sohrab (sax and vocal), Derek Nievergelt (bass), Swiss Chris (drums) and Alejandro Castellano (guitar). The line up is: Sohrab (sax & voc), Swiss Chriss (drums), Derek Nievergelt (bass) and John Kruth (on an ancient Egyptian clarinet, a low d penny whistle and a Gibson mandocello from the early 1900’s). The line up is: Sohrab (sax and voc), Damon Banks (bass), Brandon Ross (gui), Jean-Marie Collatin-Faye (djembe) and Sheikh Tairou M’Baye (sabar). The line up is: Wagane N’Diaye Rose (on sabar), Sohrab (on sax) and Chiha (on vocal).